Help/advice please from you tech minded Guys. Yesterday my grandkids visited and as usual commandeered my laptop for an hour or so. They left me a video thank you for the usual treats of pocket money, ice cream and chocolate. Now, when I play back their video there is no sound. The volume is always set to high and never muted so I can't understand what I'm doing wrong. The only thing on my mind is that I thought the laptop would have an internal microphone and I don't have an exterior plug in one. Have your heard sound on the video at all, or not? If the laptop has a camera, then it should almost certainly have a built in microphone, but quite often these are disabled in the audio settings (or the generic sound driver hasn't picked the microphone up). It's not the easiest one to solve without seeing it, but I will do my best to help if I can - I do have the ability to remote in to your PC, which we could use to take a gander if it helps. Are you certain there isn't a set of headphones attached? Thanks Guys, Yes the laptop has a built in camera which they used. I will have to try and find the audio settings as you mentioned. Don't know where it is though to be honest, I'm just a basic type computer user. Mr F C, No sound ever from homemade videos by the kids. 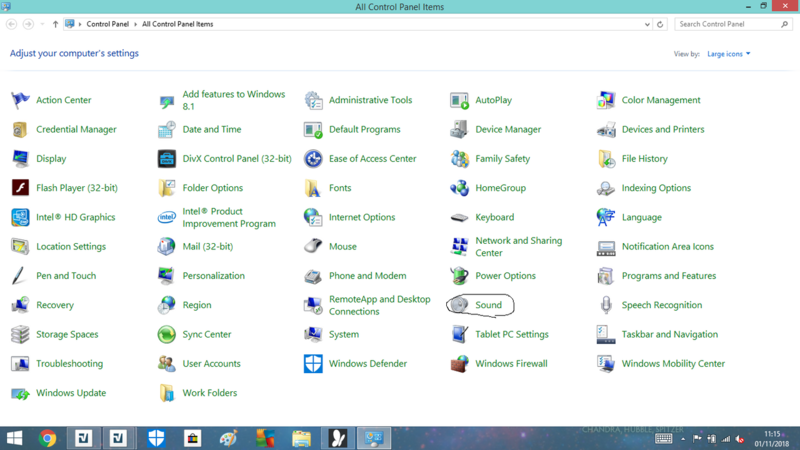 I have opened the control panel many times to try and sort this and the only part about the sound is the wWindows Mobility Centre which has no part to sort this, just the basic volume and mute settings to alter. I've now opened that but still only the small sound window opens with almost nothing to change. If i understand correctly, this video was taken via your laptop's built-in webcam, and you simply wish to play it back, on the same laptop? First i would verify whether your speakers are working. Do they play sound from other videos, music files or websites like YouTube? If you right-click the speaker icon in the bottom right of the Taskbar, you should have the option to open the Volume Mixer. Here, you can mute or change the volume of each application independently. You might want to make sure your microphone was actually working at the time of the recording. Looking in the 'Sound' window of Control Panel, you can see a tab for 'Recording'. With this selected, you can see all the available devices you can record audio from. Right-click one of them and then click 'Properties'. In this new window, select the 'Listen' tab, where you can enable instant playback of the sound it picks up. I don't suppose you can send the video to someone else? Maybe over Facebook Messenger. You may want to try playing the video through another program. I recommend VLC Media Player. Yes it is all the same laptop and the speakers work ok watching main website clips. Will try to open the sound window again. I have VLC Media installed so will try that too. thanks.